Cecilia's Cards: Tag! You're It! I'm having fun with some tags this week! 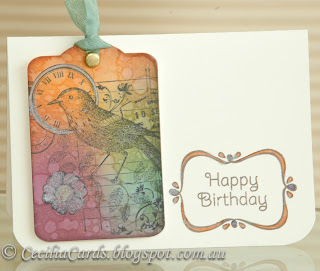 I made these two tags last night using distress inks. 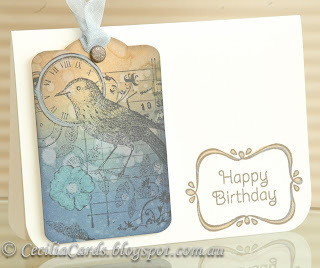 I wanted to try the water spritzing technique on the tag to create a mottled look before stamping with my new HA Timely Bird stamp - Yes, it's the first time out of the packet! As the tag is quite pretty itself, I wanted a very plain background to show it off. I also painted parts of the tag (the rim of the clock and the flower) with Perfect Pearls. I'm not embellishing this card with pearls and gems so that it can be masculine. I'm submitting the card on the left to the current HA September challenge as I used all the challenge colours (Spiced Marmalade, Peeled Paint, Pine Needles, Seedless Preserve and HA Cup O'Joe - the names sound like an afternoon tea menu). The tag on the right is going to be submitted to the current CR84FN challenge, Denim, Tan and Brown (Scattered Straw, Tea Dye, Broken China and Chipped Sapphire). 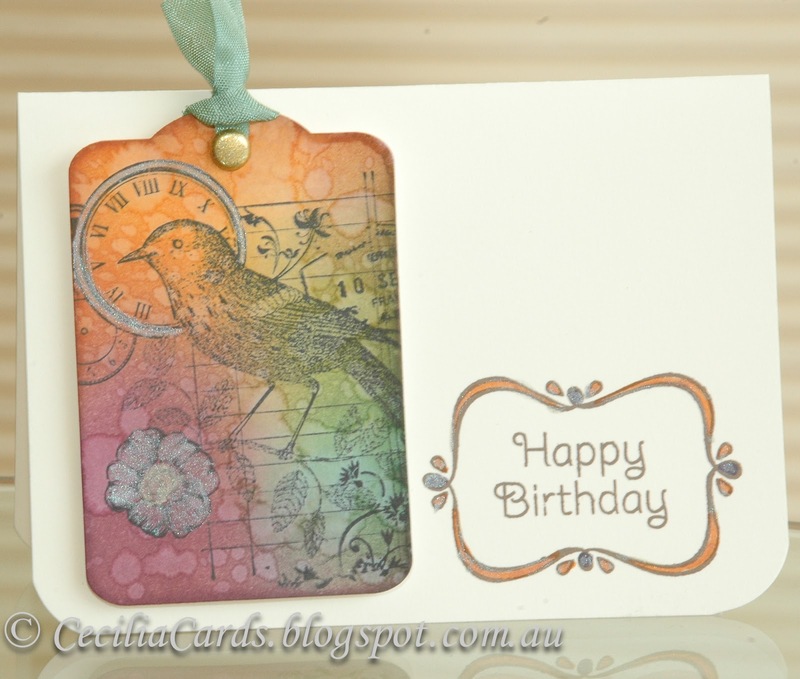 I'm also submitting this card to Moxie Fab World's Asymmetry challenge, A Blog Named Hero's Tag challenge and Simon Says Stamp's Stamptember Blog Candy Bonanza. Thank you for dropping by! A Blog Named Hero - Tag! You're It! Love your tags! Just perfect for the birthday cards, Cecilia! I think both your cards are simply delightful! Thanks for playing along with CR84FN this week! Cecelia, your bird tags are just GORGEOUS! THX for playing with us at CR84FN! Such beautiful cards. You created such great tags , love the inked bg very much. Thanks for playing with us at A Blog Named Hero.